← Do you have photos of yourself in a scarf or accessory I made? Wanna see what I’ve been slaving over since Friday? I’ve been living in a sleepless crochet-haze the last 5 days or so, working on these crochet paintings for the J-Pop Explosion art show at Hairy’s gallery. Here’s the little Q&A I did on their blog. 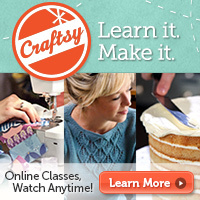 Sorry I didn’t get to blog about Craft Wars yet! Not only was I working on these crochet paintings, but I’m also planning for Renegade Craft fair, and I’m also house-sitting right now! EEP! I’ll post better/more pics of the Pocky paintings after Friday, when the show opens :). I’ll also post my initial sketches and progress pics, and you’ll get to see how things don’t always go as you planned :P. At first I was going to have parts of a 3D Godzilla on the edges of the canvas biting into a a big box of Pocky which would be the canvas itself, but then I decided to just focus on the Pocky instead! Still turned out ok, I think! Actually last night I was freaking out because EVERYTHING WAS GOING WRONG, and I thought I had to deliver the paintings in an hour. I was really sweatin’ it! Luckily, I got one more day to work on it, so I drove back home today from housesitting to get them finished up. I hope to have time to make a few smaller paintings for the fair as well! 26 Responses to Wanna see what I’ve been slaving over since Friday? OH MY GOSH. THIS IS AMAZING. I try to avoid excessive use of caps, but this warrants it. Pocky!! 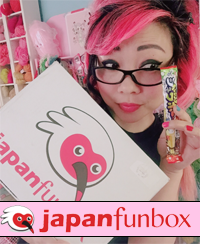 My boyfriend got me some of those Yan Yan snacks as part of my birthday present (as he tells me, he “saw an asian market and thought hey, she’s Asian and she likes snacks”… offensive, true, or both? )… but he forgot the Pocky. Anyway. This is freakin’ awesome. As if you didn’t know already. I told you this already but, I’ll say it again…THAT LOOKS AWESOME!!! now I want pocky everything! You should totally make some new designsfor your etsy (scarf, tissue cozies, etc) with pocky or even yan yan like Kelsea said. I would buy them all! OMG! The detail is unbelievable! Well done, those are so cute! INCRED!!!! I cant wait to see pics of everything!!! Thank you! I GOT YOUR PACKAGE!! But I haven’t had a chance yet to try it on. I opened it up, squeed, and then had to run out of the house cuz I’m housesitting elsewhere! Fantastic!! Did you start by stretching crochet over a pre-existing stretched canvas? Your crocheted paintings are so exciting! Yeah I have to put it over an actual canvas for support, because crochet is so heavy. It needs all that backing! Usually I sew/crochet everything together and stick it on a painted canvas at the end. Yup. I’m badass like that. Wow! 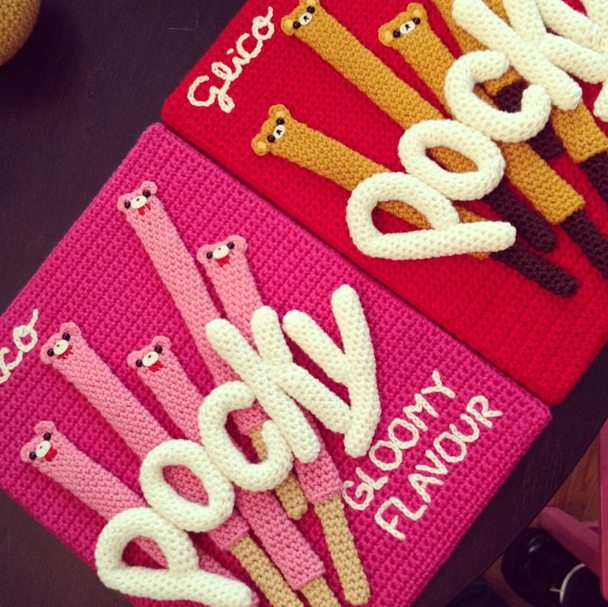 Are the Pocky “paintings” for sale or just display at the gallery? Hi hi! They were for sale but they already sold :). I think I’ll make more for Etsy, though, because they were fun!